Confession, I had chocolate chips for breakfast. Why? Good question… well, it was because we were all out of these muffins! (And also, I was making mint chocolate chip cookies, so they were tempting me,) but really, it was because we had no more muffins. It was still a good breakfast, but not nearly as satisfying as these bad boys. These are hearty, and scrumptious, and they are the perfect breakfast, especially when you are rushing out the door at 7:50 when you’re supposed to be somewhere at 8… no that didn’t happen to me this week, it’s just a hypothetical situation. These have it all, protein (walnuts!) as well as some sweetness (apples!) and hearty (oatmeal!). Don’t these just make you want to dance a little jig? Or lick your lips in anticipation, whatever floats your boat. Preheat the oven to 400 degrees. Butter a muffin tin. Start by peeling and chopping the apples, place them aside in a bowl. In a large bowl combine all the dry ingredients, (flours, oats, brown sugar, baking powder, baking soda, salt, cinnamon, nutmeg,) create a well in the middle. In another bowl, combine the wet ingredients (yogurt, apple cider, vegetable oil, vanilla, and egg). Pour the wet ingredients into the well in the dry ingredients. Mix just until combine. Add the apples and walnuts, mixing until evenly distributed. Be careful not to over-mix as that will create a very dense muffing. Using an ice cream scoop, scoop batter into the muffin tin until about 2/3 of the way full. Bake for 20-25 minutes, or until when pricked with a toothpick it comes out clean. 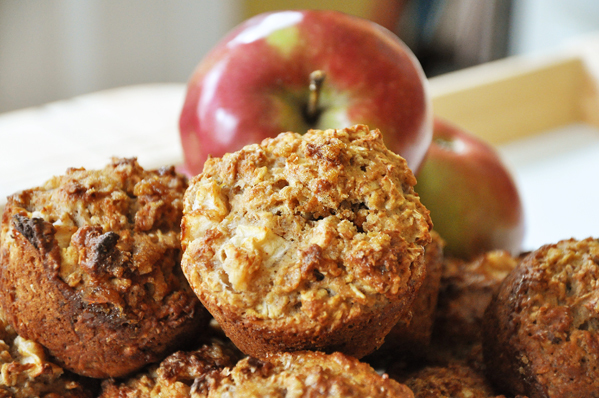 Make a batch of these and enjoy them for breakfast this week! Yum! This is totally my kind of muffin recipe. Healthy and delicious :). @Vivienne - Definitely perfect for on the go breakfasts, I'm going to bake a new bunch today for this week! Love trying all these muffins, very nice, thanks so much for the recipe. These look so great! Perfectly healthy and scrumptious... I can't wait to try these! Considering, that there is no butter, not a lot of sugar and mostly whole wheat flower - these muffins turned out pretty good! I will definitely make them again! Thanks Daniela, so glad you enjoyed them!